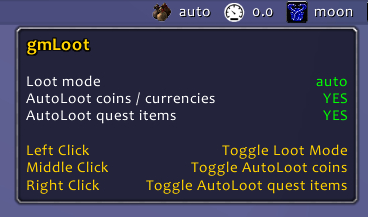 A small LDB plugin to change the current loot specifications (AUTOLOOT yes/no) and to autoloot coins and currencies and/or quest items only. It manages also AutoDeposit reags at bank. It shows in a broker display compatible the actual loot settings. The original looting idea is from "Semi-Auto Looter" by SmileySL. Requires a data broker display like chocolate bar, bazooka, ninjapanel, stat block, titan panel, docking station, buttonbin and more.